Background: Complicated parapneumonic effusion and empyema (CPE/empyema) are serious complications of community-acquired pneumonia (CAP) associated with significant morbidity. The aim of this study was to identify key factors on admission predicting the development of CPE/empyema in patients admitted with CAP. Methods: The authors conducted a prospective observational study of patients admitted with CAP. Multivariate logistic regression was used to evaluate admission factors that could predict the development of CPE/empyema including admission demographics, clinical features and laboratory tests. 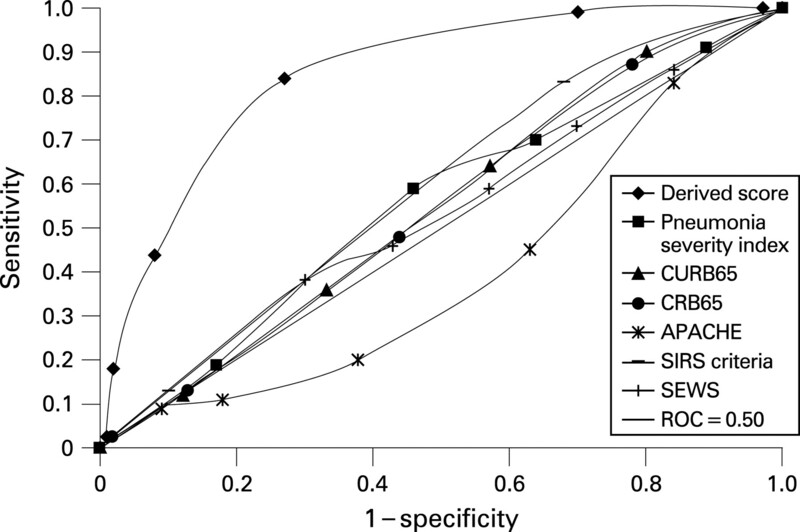 Pneumonia specific (PSI, CURB65 and CRB65) and generic sepsis scoring systems (APACHE II, SEWS, SIRS) were compared using the area under the receiver operator characteristic curve (AUC). Complicated parapneumonic effusion was defined according to the criteria described by Light and colleagues as pleural fluid pH <7.2, LDH >1000 iu/l, glucose <2.2 mmol/l. Empyema was defined as frank pus aspirated from the pleural space or positive Gram stain/culture for pathogenic organisms. Results: 1628 patients with respiratory infections were identified and ultimately 1269 patients with CAP were included in the study. 92 patients (7.2%) met the criteria for CPE/empyema. CURB65 (AUC 0.54) CRB65 (0.52), PSI (0.55), APACHE II (0.41), SIRS (0.57) and SEWS (0.53) had no value in CPE/empyema. Multivariate logistic regression identified albumin <30 g/l odds ratio (OR) 4.55 (2.45 to 8.45, p<0.001), sodium <130 mmol/l OR 2.70 (1.55 to 4.70, p = 0.005), platelet count >400 OR 4.09 (2.21 to 7.54, p<0.001), C-reactive protein >100 mg/l OR 15.7 (3.69 to 66.9, p<0.001) and a history of alcohol abuse OR 4.28 (1.87 to 9.82, p = 0.006) or intravenous drug use OR 2.82 (1.09 to 7.30, p = 0.03) as independently associated with the development of CPE/empyema. A history of chronic obstructive pulmonary disease was protective OR 0.18 (0.06 to 0.53, p = 0.002). A six-point scoring system using these combined variables was devised. In the presence of two or more of these factors the derived score had a sensitivity of 87%, specificity of 68.3%, positive predictive value of 17.7% and negative predictive value of 98.5%. The score had good discriminatory value AUC 0.84 (0.81 to 0.86, p<0.001). See fig. Conclusion: This study has identified seven clinical factors predicting the development of CPE/empyema. Independent validation studies are needed. Abstract S115 Figure Receiver operator characteristic curves for prediction of complicated parapneumonic effusion or empyema. Background: Data suggest that polymicrobial biofilms exist in the cystic fibrosis lung that may contribute to the exaggeration of illness or infection. It is unclear if polymicrobial biofilms are seen with other causes of bronchiectasis. Limitations in standard culture (overgrowth by other bacteria/resilience of microorganisms to standard culture techniques) mean standard culture may not detect the diversity of bacteria present in non-cystic fibrosis bronchiectasis. Current clinical culture techniques use an a priori decision on which organisms are likely to be present/important as causative infectious agents. Hypothesis: Greater biodiversity will be found using non-culture-based techniques in bronchiectasis sputa compared with standard culture. 16S ribosomal RNA analysis will allow for the detection of bacteria that are resistant to culture. Methods: Twenty-four sputa samples were collected from 21 adult bronchiectasis patients and analysed using standard culture. Total bacterial community from extracted nucleic acids was profiled using PCR density denaturing gel electrophoresis (DGGE) community profiling with band sequencing/in silico analysis. In vitro cultures. Results: A range of pathogens was isolated from the sputa; in seven sputa no pathogens were isolated, Pseudomonas aeruginosa (PA 9), Staphylococcus aureus (SA 2), Streptococcus pneumonia (SP 2), Haemophilus influenzae (HI 2), Moraxella (Mx 2), Serratia 1 and Proteus (PR 1). In four sputa two pathogens were co-cultured; SP + PA, PR + coliform, HI + Mx and PA + HI. PCR–DGGE results: Preliminary analysis of 12 of the 24 sputa analysed indicate a complex bacterial community with 72 bacterial ribotypes identified allocated to 29 ribotype classes. Phylogenetic analysis reveals the presence of several pathogenic organisms not previously identified through culture based techniques and a far greater diversity of bacterial organisms than previously assumed. Conclusions: The results to date indicate the possibility that non-cystic fibrosis bronchiectasis lungs are polymicrobial, with the detection of pathogens previously resistant to culture. These results are significant in the understanding and treatment of colonisation or subclinical infection in adult bronchiectasis patients. Better understanding of complex microbial communities may lead to atypical antibiotic combinations or novel approaches targeting biofilms. Introduction: The Streptococcus pneumoniae polysaccharide capsule is an essential virulence factor that varies in structure between capsular serotypes. Specific serotypes are known to be highly invasive, but it is currently unknown why these strains frequently cause infections whereas other serotypes are generally restricted to nasopharyngeal colonisation. As complement is a vital immune component to S pneumoniae and the capsule affects complement deposition, we hypothesised that capsular serotype-dependent differences in complement susceptibility may influence invasiveness. Therefore we have investigated: the relative importance of capsule and strain background for complement deposition on S pneumoniae; whether differences in complement sensitivity between serotypes correlate with invasiveness. Methods: C3b/iC3b deposition on bacteria was measured in 25% human serum using flow cytometry for: isogenic S pneumoniae strains expressing capsular serotypes 4, 6A, 7F, 23F; four different clinical isolates with different genetic backgrounds for each of serotypes 4, 23F, 6A, and 14; further clinical isolates representing invasive and non-invasive serotypes. Results: The relative fluorescence index (RFI) of C3b/iC3b deposition on isogenic strains varied with capsular serotype, with serotype 6A showing particularly high levels (848% of results for serotype 4). Results for sera deficient in specific complement components suggested these differences were mainly mediated by alternative pathway activity and independent of antibody levels. Some strains with different genetic backgrounds but the same capsular serotype also showed clear differences in C3b/iC3b deposition (eg, RFI for serotype 23F ST515 strain 8174 ± 490 vs 39321 ± 2293 for the ST277 strain). The median RFI C3b/iC3b deposition on 12 strains from invasive serotypes 1, 4 and 14 was 37890 (interquartile range (IQR) 16240–45409) compared with a median 65980 (IQR 37723–95143) for 18 strains of non-invasive capsular serotypes 9V, 6B, 23F and 19F (p = 0.0118). Conclusions: C3b/iC3b deposition on S pneumoniae varies markedly between strains due to both capsular serotype but also due to other genetic differences. Invasive serotypes had lower levels of C3b/iC3b deposition than non-invasive strains and are therefore probably more resistant to complement-mediated immunity. To our knowledge these are the first data suggesting why some S pneumoniae strains are more likely to cause invasive disease than others. Mast cells play a key role in allergic and inflammatory diseases. Whereas mast cell research is often centred on their deleterious pathological effects, they also play important roles in homeostatic physiology, with increasing evidence emerging for roles in both innate and adaptive immunity. Mouse mast cells have recently been shown to play a pivotal role in protection against bacterial infection, and cord blood-derived mast cells reduce bacterial viability in culture. We thus hypothesised that tissue-derived human lung mast cells (HLMC) would be protective against pneumococcal lung infection through direct antimicrobial activity. HLMC markedly reduced the number of viable wildtype (WT) serotype-2 (D39) pneumococci in co-culture, but had no effect on the viability of an isogenic pneumolysin-deficient (PLN-A) pneumococcus. In addition, despite evidence of phagocytosis of both WT and PLN-A pneumococci by mast cells, the majority of this antimicrobial effect did not require cell–cell contact since separation by a membrane did not eliminate WT pneumococcal lysis, suggesting that mast cells release antimicrobial agents upon activation with pneumolysin. We therefore studied the effects of WT and PLN-A pneumococci on mast cell mediator release and found that WT, but not PLN-A, pneumococci induced the release of LTC4 from mast cells in a dose-dependent manner, which was not accompanied by histamine release. In addition, stimulation of mast cells with sublytic concentrations of purified pneumolysin replicated this effect. Interestingly, WT pneumococci reduced HLMC viability in a dose-dependent manner after 1 h of incubation, which was more evident after 6 h. As pneumolysin is a key virulence factor of pneumococci, we next tested the effect of the pneumolysin deficient (PLN-A) isogenic mutant. PLN-A also reduced HLMC viability although to a lesser degree, suggesting that pneumolysin is only partly responsible for HLMC cytotoxicity. Indeed, a cytotoxicity assay with pneumolysin revealed that HLMC were resistant to lysis by pneumolysin. In summary, HLMC resident in the airways and lung parenchyma are endowed with direct antimicrobial capability and release pro-inflammatory mediators, which have the ability to recruit professional phagocytes. This unusual phenomenon of specific generation of newly formed mediators without the release of preformed granule-stored mediators is consistent with the activation of TLR-4 by pneumolysin. Streptococcus pneumoniae is the leading cause of community-acquired pneumonia worldwide, resulting in high mortality. Galectin-3 (gal-3), a beta-galactoside binding lectin implicated in many facets of the inflammatory response, accumulates in the lungs of mice infected with S pneumoniae correlating with the onset of neutrophil extravasation. We tested the hypothesis that gal-3 reduces the severity of pneumococcal pneumonia by augmenting neutrophil function using both in vivo and in vitro techniques. In vivo, gal-3 deficient (gal-3-/-) mice develop more severe pneumonia following S pneumoniae infection, as demonstrated by increased bacteraemia and lung damage compared with wild-type mice. In vitro we show that gal-3 directly acts as a neutrophil-activating agent and potentiates the effect of fMLP, exogenous gal-3 augments neutrophil phagocytosis of bacteria and delays neutrophil apoptosis, phagocytosis of apoptotic neutrophils by gal-3-/- macrophages is less efficient compared with wild type, gal-3 demonstrates bacteriostatic properties against S pneumoniae. Furthermore, add-back of recombinant gal-3 in vivo protects gal-3-/- mice from developing severe pneumonia. Together, these results demonstrate that gal-3 is a key molecule in the host defence against pneumococcal infection. Therapeutic strategies designed to augment gal-3 activity may both enhance inflammatory cell function (by directly affecting neutrophil responsiveness and prolonging neutrophil longevity) and have direct bacteriostatic activity, improving clinical outcomes after severe pneumococcal infection. Introduction: Although the Streptococcus pneumoniae capsule is known to be an essential virulence factor, there are surprisingly few data on how the capsule prevents pneumonia. 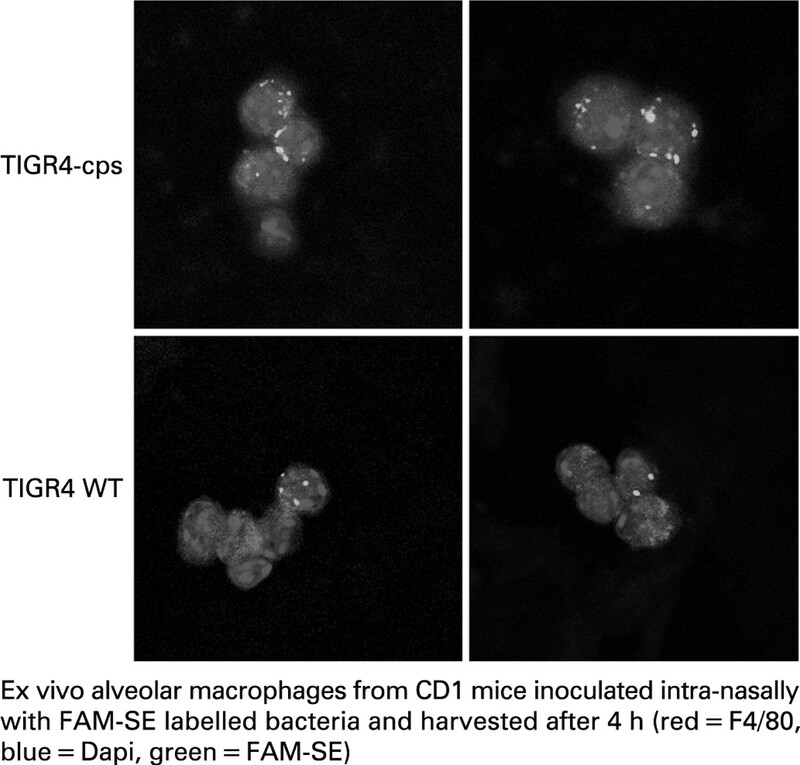 We have therefore investigated the effects of the S pneumoniae capsule on complement-dependent phagocytosis and on interactions with alveolar macrophages (AM) in a mouse model of pneumonia. Methods: Using encapsulated and genetically engineered unencapsulated S pneumoniae strains from two serotypes (2 and 4) the following experiments were performed using flow cytometry and confocal microscopy: C3b/iC3b deposition on bacteria in human serum; phagocytosis by a macrophage cell line and neutrophils extracted from human volunteers (using cytochalasin D and trypan blue to differentiate between phagocytosis and adherence to cell surfaces); phagocytosis by mouse AM 6 h post-intranasal inoculation of bacteria into wild-type and complement-deficient mice. In addition the rate of clearance of bacteria from the lungs was assessed. Results: C3b deposition was markedly increased on unencapsulated compared with encapsulated strains (eg, relative fluorescence index (RFI) of C3b deposition of 211 130 ± 19 227 vs 11 378 ± 1814, respectively, for the serotype 4 strain). Unencapsulated bacteria were more readily phagocytosed by neutrophils than encapsulated bacteria (proportion of neutrophils associated with bacteria 49 ± 1.56 vs 17 ± 0.6, respectively, for the ST4 strain) and these differences were mainly complement dependent. Furthermore, unencapsulated bacteria stimulated greater nuclear transfer of nuclear factor kappa B (NFκB) in macrophages than encapsulated bacteria (median of nuclear : cytoplasmic ratio for unencapsulated of 4.096 (interquartile range (IQR) 3.32–4.664) vs 2.943 (IQR 2.719–3.122) for encapsulated strain). Within 6 h of intranasal inoculation there was a marked increase in phagocytosis by AM of the unencapsulated (RFI of 2498 ± 615) compared with encapsulated (RFI 9349 ± 3404) (fig), and this was associated with rapid clearance of unencapsulated bacteria (>3 log10 fewer unencapsulated bacteria for the serotype 4 strains) from lavage fluid. Interestingly, repeated experiments with complement-deficient mice demonstrated that the effect of the capsule on interactions with AM was only partly complement dependent. Conclusions: These data demonstrate that capsule is vital for S pneumoniae evasion of early pulmonary immune responses by inhibiting complement-dependent and independent interactions with AM.